I didn't know we were golfing today, I would have brought my clubs! Did you star in "Weekend at Bernie's"? Hey blue, that call was a get outta here quick call! That was higher than a t-shirt at Mardi Gras! It's against the law to make prank calls! (Hold up cell phone) Is this your cell phone? Because it has three missed calls! That pitch was like your last date, you didn't want to see her or call her. To batter as he steps into the box: "You better be swinging. You're standing in the strike zone." He was as out as a deaf kid playing musical chairs! After the ump has dusted off home plate: "You're gonna make someone a great wife someday! You're not gonna sleep a minute tonight because you've slept all game. Did you make the call on WMD in Iraq as well? Is your rule book written in braille? That's why they shouldn't let umpires date the players. I didn't pay 35 bucks to watch you call strikes! Keep calling em like that and you'll be bagging groceries by September. Get a hammer and some nails, the plate is movin' around! You call more strikes than a union delegate! Did your glass eye fog up? Have you lost your strike zone in the lights? You're making more bad calls than a telemarketer! How about some Windex for that glass eye! The French judge says it's a strike! How can you eat with those hands? You need to go to confession after that call! I've seen better Blues in a box of crayons! Don't bother brushing off the corners, you're not calling them anyway! We know you're blind, we've seen your wife! They're putting your strike zone on the back of milk cartons! Mix in some consistency once in awhile! You must be losing them in the lights! Why do you keep looking in your hand...do you have a map of the strike zone in it? I've gotten better calls from my ex-wife! Good thing there is not three choices! Hey ump is that a dinner plate? Apparently it has no corners! Why don't you get your Seeing Eye dog to call it for you? I forgot the Milk-Bone for your seeing-eye dog! 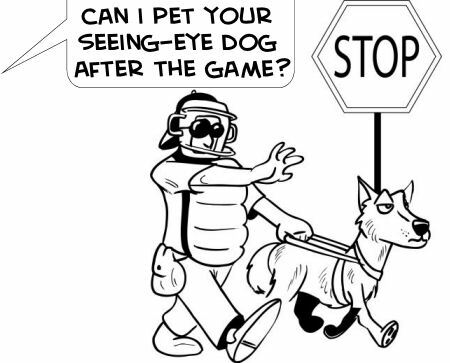 Can I pet your seeing eye dog after the game? When your dog barks twice, its a strike! Kick your dog, he's lying to you! Be careful when you back up, so you don't fall over your dog! Did you haul in your strike zone on a tractor trailer bed? Hey Blue, if you had another eye it would be lonely! I've heard better calls at a square dance! I've heard better calls between two tin cans and a piece of string! Hey Blue, were you looking for the curve? So which one of you is the designated driver? Move a little Ump, you're growing' roots! I've seen better blue in a toilet bowl! What's a matter you Gotta Broken Arm? Look through the mask, not at it! It really is hot today - that strike zone is melting! You couldn't call a cab! Its a strike zone, not an end zone! You really shouldn't be in the game until you get warmed up! Come on blue, turn that mask around and get a GOOD look!! You can go home blue, we'll take it from here! How'd you become an umpire? Flunk out of tollbooth school? How about asking the audience? Do you want to use another lifeline? What were you, a lookout.. at Pearl Harbor (alt:"..on the Titanic")? (For an umpire is slow getting in position) C'mon blue, put the Snicker Bar down. Sweep the plate! It's the least you can do! Move around, you're tilting' the infield! Move around Ump, you're killing' the grass! It sure sounded like a strike! How'd you get a square head in that round mask? Have they stopped printing the rulebooks in Braille? Does your wife let you make decisions at home? Wipe the dirt off that called strike! Sure you don't want to phone a friend? You can open your eyes now! Do you get any better or is this it? Do you travel with this team? Come on, MCI doesn't make that many bad calls! You couldn't make the right call if you had a phone book! You couldn't make a call in a phone booth! Do you take Visa or American Express? Leave the gift giving to Santa! Take out your glass eye and wash it! OK....the next call should be ours! Guess again, the last call was wrong! Who signs your game checks? Is that guy your nephew Ump? Hey, Sleeping Beauty, wake up! Hey Blue, Magnum P.I. called, he can't find your strike zone! I've seen potatoes with better eyes! Looked pretty good from up here ump! Do your sleeping at home ump! For a guy that only works 2 hours a day, you're doing a pretty bad job! You couldn't see the plate if your dinner was on it! Wake up Ump, You're missing a great game! Somebody call the law, this guy is impersonating an umpire! Ump, you're calling a worse game than a NFL ref! Now I understand why you and the other manager look so much alike! You're like a bat without sonar! Here's a quarter, go buy a strike zone! Hows work experience going ump? He must be wearing a (visiting team) t-shirt under that jersey. 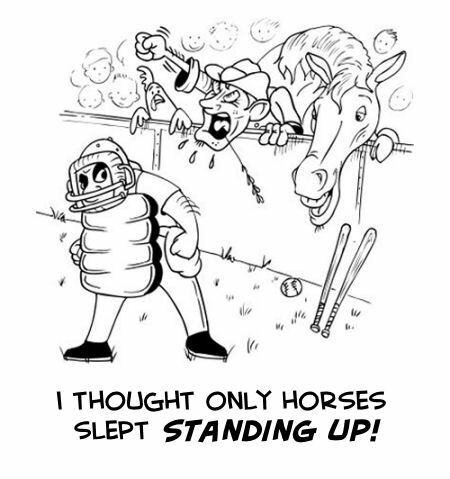 Keep making calls like that and you'll be demoted to the pony league! Somebody get the ump his prescription mask! Lenscrafter called...they'll be ready in 30 min. Next time buy a ticket if you're going to watch! Hey ump…if you had one more eye, you’d be a cyclops! We know you’re blind, we’ve seen your wife! “Easy Flinchy” – After a slight flinch behind the plate. You blinking way to long?!!!!! come on ump, that pitch was so far outside it had a hat and coat on! yelled at me by a ‘little old lady’ while i was calling a game in the 60’s.